Exciting news! We found a house and close in one week! After scoping out neighborhood after neighborhood, we finally decided to settle in our current neighborhood of North Tacoma. Admittedly, I got my way on that. Adam would have preferred to live on a nearby lake. That could have been lovely, especially during the summer months. But ultimately I just love urban, walkable neighborhoods with charming old homes. We not only have easy access to one farmers market but there are THREE farmers markets each week- all within about a mile or two from our new home! And our new home is a dream come true. It’s a Dutch Colonial built in 1922 with tons of character. The nice part is that its been updated and won’t require too much work from us. The basement is completely finished and will make the perfect “man cave” for Adam. (Ultimately how I got my way on the house!) The house has views of Puget Sound and Commencement Bay and is on a double lot so I should have plenty of room to play in the yard! The current landscaping is very nice but a little too formal for my taste. I plan on taking out some shrubbery and putting in a cottage garden on the side of the home- somewhere for flowers, herbs, and vegetables to mix. I am beyond excited to get started and so happy that we don’t plan on moving for a very long time. I still miss my garden in Albany and find myself wondering how the columbine looks this year or whether the roses survived the winter. I am ready to fall in love with a new space. Our containers that the kids and I planted a couple of months back are really thriving and it’s so great that we can just move them to our home with us! We have a couple pots of peas, carrots, and a gorgeous container of lettuce. This transition period has been a nice to excuse to experiment with container gardening. One thing I have noticed with our veggie pots is that the ones on our front porch get a little less sun so the peas aren’t nearly as tall as the ones further out in our yard. Yet the lettuce is absolutely gorgeous and not wilted in any way. I have continued to cut the lettuce and it comes right back. Here lies the beauty of planting in containers- you can move them! If you find that a spot doesn’t get enough sun, simply relocate to another area. The same is true for greens and lettuces that like a cooler space. You can find or create micro-climates around your home to maximize growing success. This can be really important for peppers or tomatoes that need a lot of heat. These can perform really well in an area by your house that really cooks- like in front of a garage where the sun beats and then reflects back. While I am extremely excited to create a more permanent garden like the one I had in Albany, I will continue to use containers to grow some of my vegetables. Plus, I just think they look really cool intermixed with raised beds. Here are some photos of our veggie pots- cannot wait to show you photos of our new home and update my slideshow on the homepage! 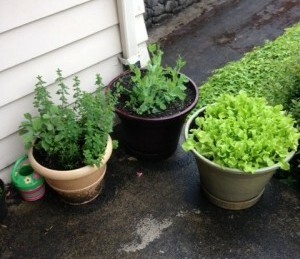 These are the containers on the front porch- herbs, peas, and lettuce. 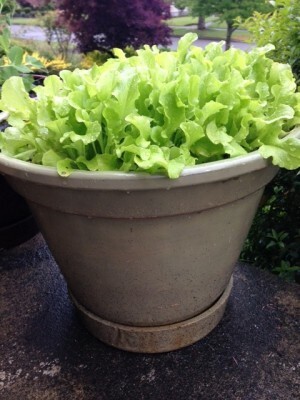 Lettuce pot- isn’t it cute? I used a variety of cut again lettuce that is very convenient! Awesome, awesome and TRIPLE awesome!! I love that you did this. You are giving me ideas for container gardening since our “Box” garden from 3 summers ago has been overtaken with JUST strawberries and weeds. 🙂 Ever since Brian’s surgery… no love has been given to the box… but the Strawberries continue to show us lots of love. Fun post. I learn a lot from you. Oh… and ask Uncle Tracy about thinning carrots. Seems I remember Brian asking him his advice on this… and he definitely has the answers. Definitely give it a shot, Michele! 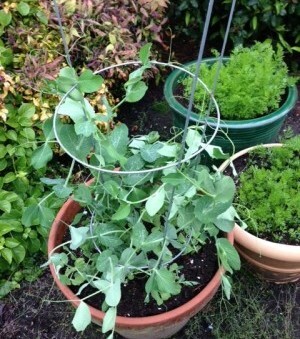 It’s really nice that gardening can be made simple with a few pots. 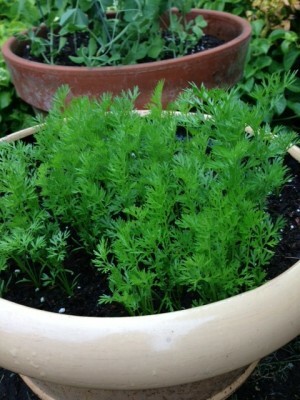 The carrots in a pot is sort of fun (saw it on Pinterest). I believe they will just be long and skinny but I should probably thin them a little bit. Gavin and Olivia sort of just dump the seeds so they end up very closely planted! Ha! Your pots are great! So excited for all the possibilities in the new home!